Plot hole: An important plot point (in the book and the film) is that Charles Calthrop - thought to be the Jackal, at that stage - played some mysterious part in the 1961 assassination of Rafael Trujillo, the dictator of The Dominican Republic, and rumours of his involvement came to the attention of MI6 and Special Branch, leading to the accidental exposure of the Jackal's false passport. In fact there is no mystery at all about the assassination of Trujillo and there were no shadowy foreigners involved. It was organised by Trujillo's own senior aides, amongst them General Juan Tomás Díaz, Antonio de la Maza, Amado Garcia Guerroro and General Antonio Imbert Barrera. The gunmen was later identified as Luis Aniama Tio. All the conspirators except Tio were arrested, tortured and shot. There was no panicked evacuation of foreigners who were involved with Trujillo's regime and no reason for them to be concerned - the government did not fall and Trujillo's brother Hector took over as President, ruling in a brutal and totalitarian manner for a further eight years. Any rumours of a mysterious Englishman would have been dismissed out of hand and would not have made it onto even the lowest level filing system anywhere in Whitehall. Plot hole: When the French conclude - incorrectly - that Charles Calthrop is the Jackal, they contact the British authorities and obtain his file photograph from the passport office. The photograph is of Edward Fox in character as the Jackal - but it shouldn't be! The Jackal and Calthrop have no connection. The Jackal never used his identity and did not apply for a false passport in his name. The photo should have been of Edward Hardwicke in character as Charles Calthrop, who appears in the closing minutes of the film. The two actors do not look anything like each other. Trivia: The Jackal demands $500,000 (US) to assassinate De Gaulle, which seems like a modest amount for such a dangerous job. However, when you take inflation into account that was the equivalent in 2019 money of over $4m. No wonder his putative employers are surprised. 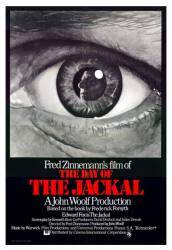 Trivia: Fred Zinnemann wanted the Jackal to be played by an anonymous actor, so he passed over established stars such as Michael Caine, Roger Moore, and Jack Nicholson in favor of Edward Fox. He later admitted that his decision might have been what contributed to the film's sub-par performance at the box office. Lebel: It's obvious that the Jackal has been tipped off all along, and yet he's decided to go ahead, regardless. He's simply challenged the whole lot of us. Minister: Are you really suggesting that there's a leak from inside this room? Lebel: I can't say. But we think that the Jackal is now in Paris with a new name and a new face, probably masquerading as a Danish schoolteacher. The Interrogator: You're being very foolish, Victor. You know yourself, they always talk in the end. You've seen it with your own two eyes in... where was it, Indochina? And Algeria, of course. Why don't you tell us what they're waiting for in that hotel, eh? Rodin, Montclair, Casson: what are they planning, who have they been meeting? Nobody? Not a soul, hmm? Then where were they before they went to Rome, eh? Tell us, Victor. Caron: You know, sir, what they'll do to you if you don't catch this man in time. Lebel: I've been given a job to do, so we'll just have to do it. Caron: But no crime has been committed yet, so where are we supposed to start looking for the criminal? Lebel: We start by recognizing that, after De Gaulle, we are the two most powerful people in France. Question: What is cordite? And does it really work? Chosen answer: According to Wikipedia: "Cordite is a family of smokeless propellants made by combining two high explosives: nitrocellulose and nitroglycerin, i.e. it is a double-base propellant. However, Cordite N, a triple-base propellant is also used. Cordite is classified as an explosive, but it is normally used as a propellant for guns and rockets." So yes, it works. Question: I have seen this movie many times, but one question continues to bother me: How did the Jackal plan to escape if he was successful in shooting the president? (He had already removed his disguise). Chosen answer: He would have just slipped away into the crowd, probably with some minor alteration to his appearance. He was a master of disguise and no one knew his real identity or what he looked like. Answer: When the Jackal entered the parade area, he was disguised as an old army veteran, with one leg and false I.D. When the job was done he would walk out as a younger man with two legs and another set of of false I.D.